Well there's that and I saw another thread that had a similar design to that helmet plus it would make their helmet a lot better. 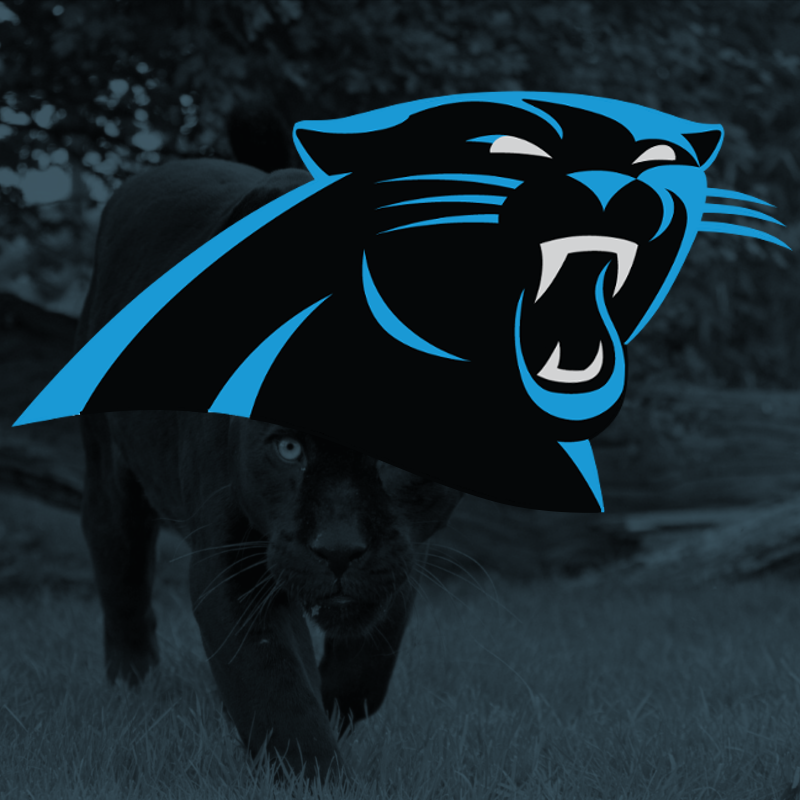 A while back someone on the boards pointed out some of the flaws with the current Panthers logo and ever since then, the wonkey left eye and slightly out of perspective lower jaw/teeth has driven me nuts. So, I have made some tweaks, I think i fixed the perspective issue and made the shape of the left eye more similar to the right one. The uniforms feature black helmets, which I am picturing with a high gloss finish. The new striping pattern is based on "speed lines", the Panther's whiskers, and the detailing on the wordmark. 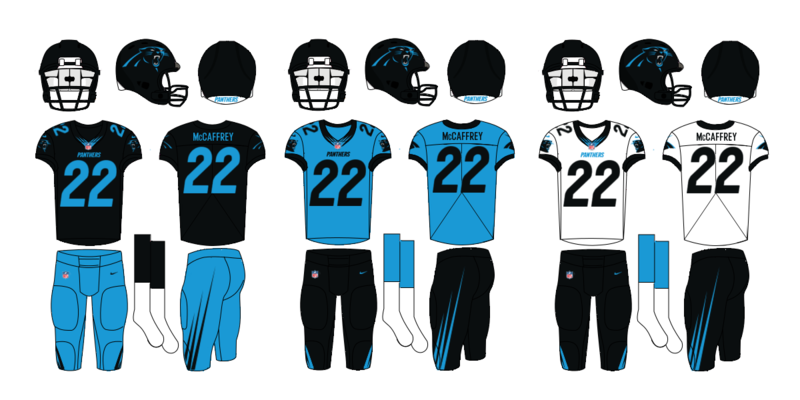 The pants stripe wraps around the front of the pants onto the knee and the collar striping would be a detail unique to the Panthers in the NFL. 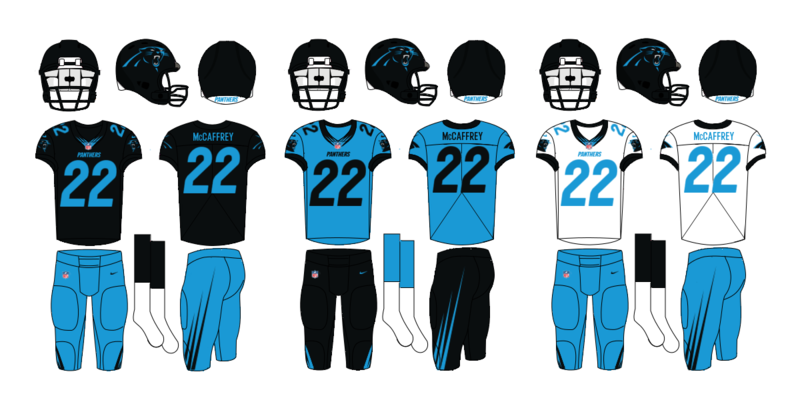 The Panthers' bold electric blue is strong enough, IMO to be used for sleek, modern single-color numbers on the jerseys. The primary home pants remain silver and the primary home pants are now black. 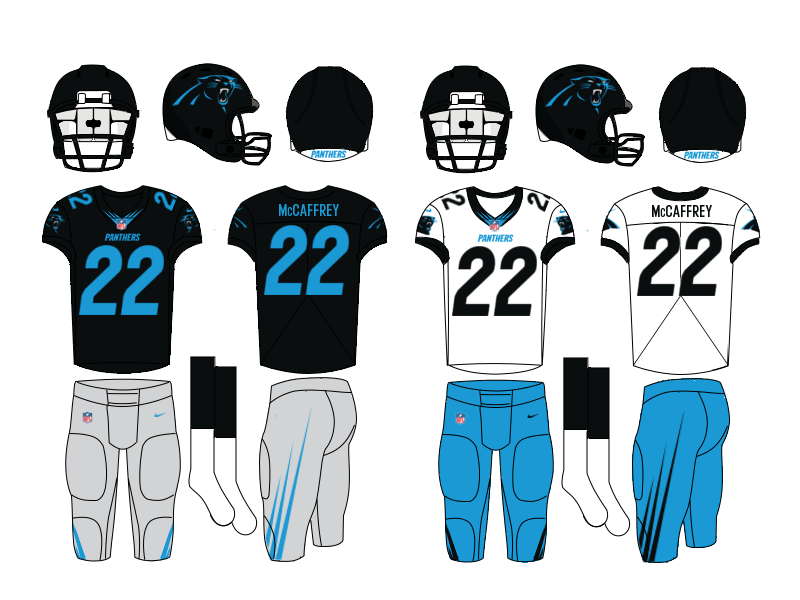 The alternate jersey remains blue and is an inverse of the black jersey. 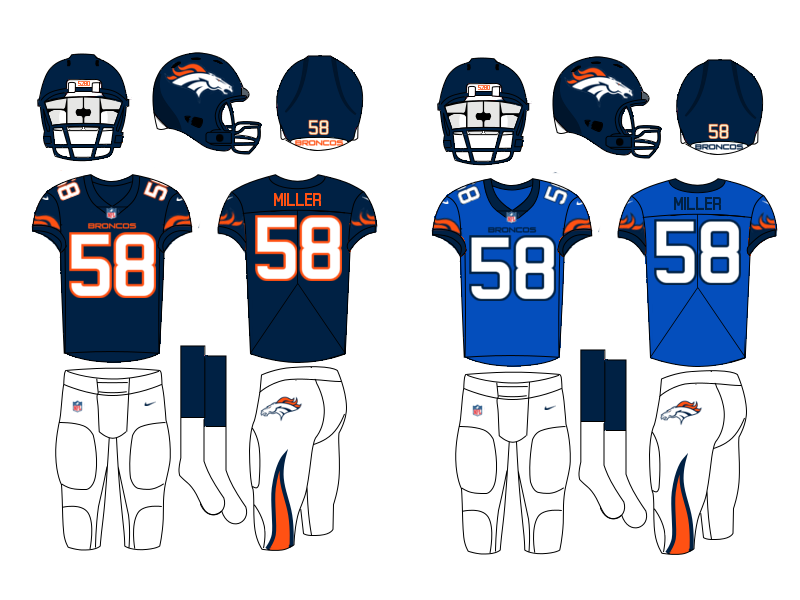 I introduced blue pants into the rotation and thy are shown here with the blue jersey, but wouldn't necessarily be worn with the blue jersey. 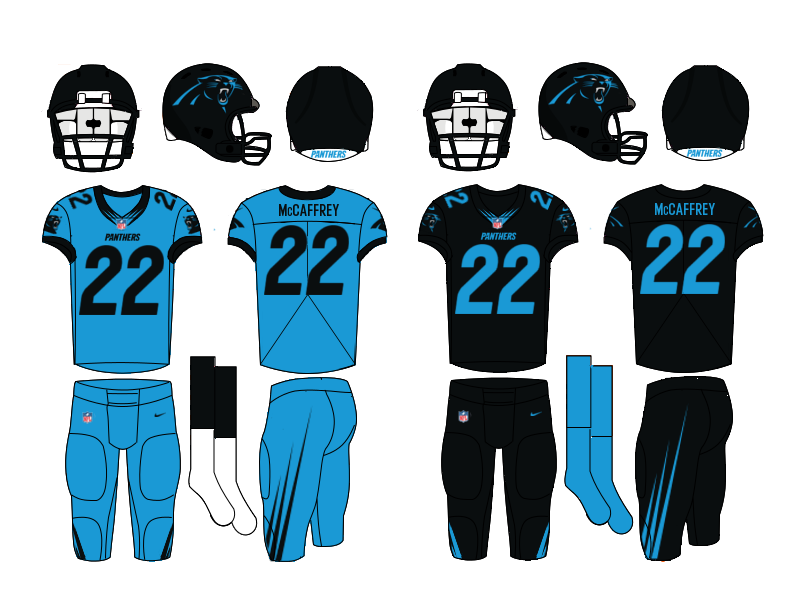 The Color Rush uniform is the "Black Panther" uniform, paired with all-blue socks to balance out all of the black. So, please feel free to let me know what you think, I always appreciate any and all feedback. Thanks for taking the time to have a look. I’m not a big fan of the number font. 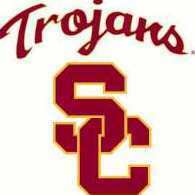 It just doesn’t really fit the teams identity in my opinion. 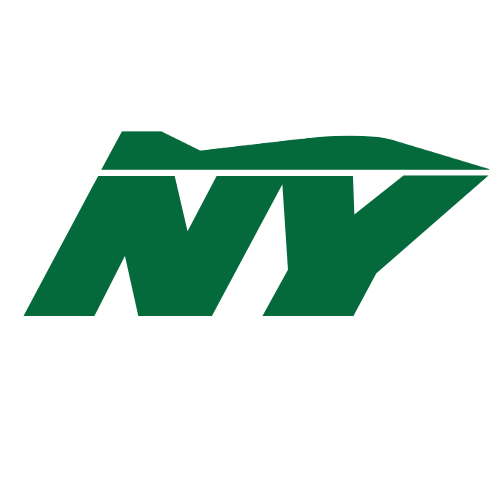 I also think the logo gets kinda lost in the black helmet. Other than that, I love how the away jersey looks with blue pants. The white jerseys need an outline on the numbers. The number font is based on the wordmark, a sans serif italic font. I actually thought it worked really well. What would you have in mind to change it to? The idea behind the black helmet was kinda for it to get "lost". All you see is the highlights of the black fur flashing in the light, or maybe I'm over thinking that. 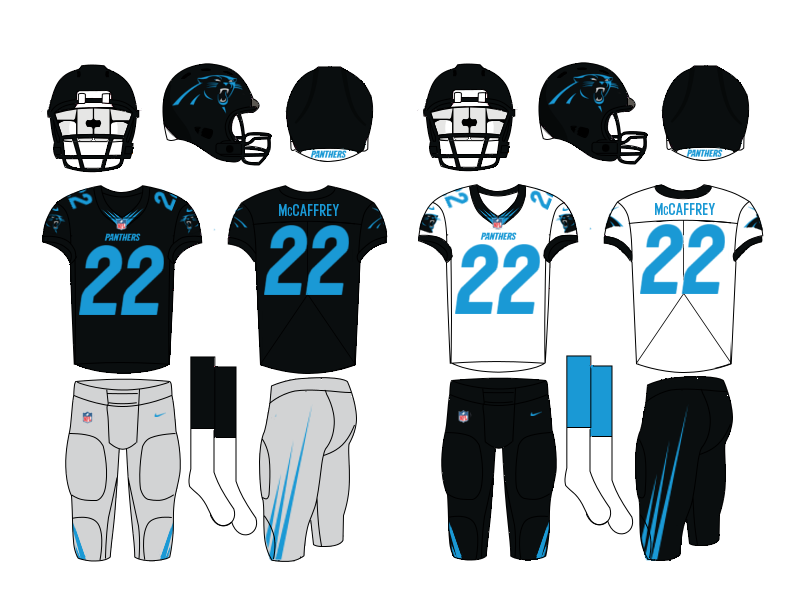 I want to avoid outlines on the numbers, so here is a white jersey with black numbers and blue pants as the primary. 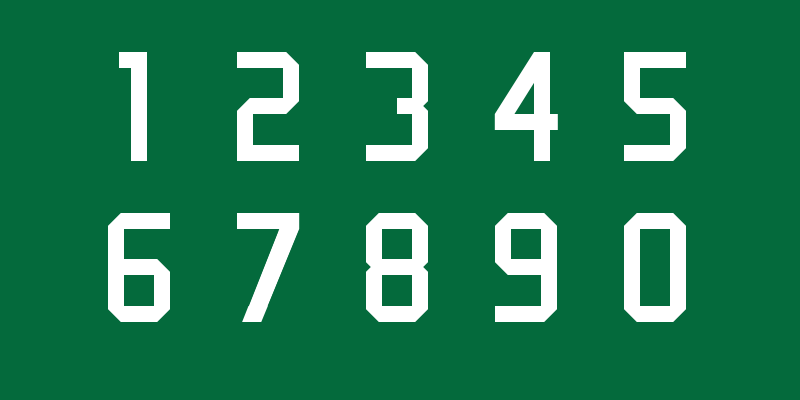 he number font is based on the wordmark, a sans serif italic font. I actually thought it worked really well. What would you have in mind to change it to? The idea behind the black helmet was kinda for it to get "lost". All you see is the highlights of the black fur flashing in the light, or maybe I'm over thinking that. If you’re going for a more modern look for the team then I completely agree with the number font, other than that I really don’t know what you should change it to. And I like the idea you were going with for the helmet. Everything makes sense now that you’ve explained it, so, thanks! I think that the black jersey needs an outline. It just kinda blends for me and makes it a little hard to see. I don't get the point of having the home pants be silver but then not having the color anywhere else in any of the uniforms. It looks like you're trying to de-emphasize silver; perhaps you should just remove it entirely for this concept? Well I kept the silver pants because the Panthers have always worn silver pants and the teeth/eyes are still silver in the logo, so I kept the silver pants as the primary home pants. To be honest, they don't look good with the blue or white jersey, but I'm still hesitant to get rid of silver entirely. Huh. Hadn't noticed the remaining silver in the logo. So here's a new one today. This concept is more of a tweak that fixes some problems that have come up with the uniforms over the years. 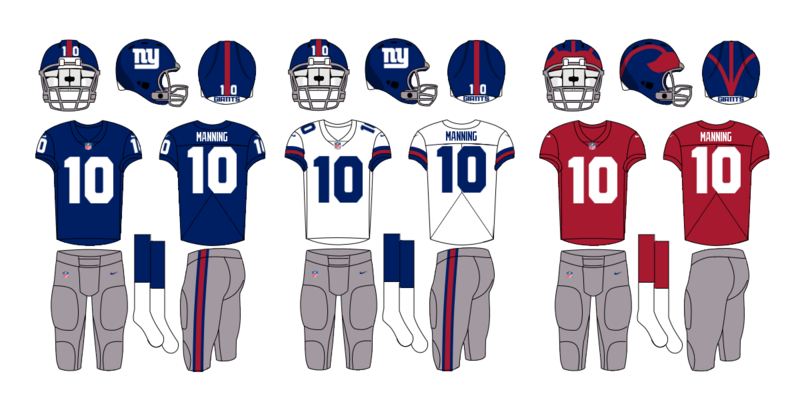 When the New York Giants first unveiled their current uniforms, they were damn near perfect. 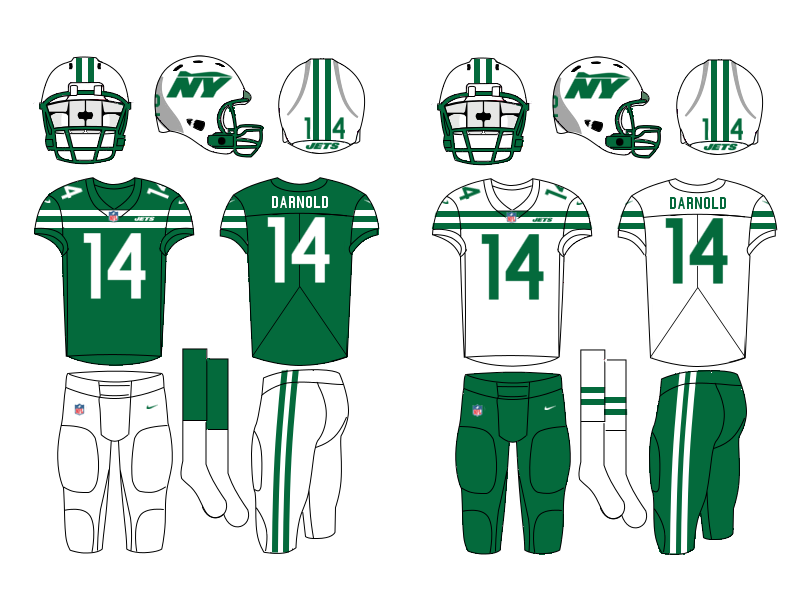 Since then, they have chipped away at the uniform's greatness by changing the pants stripes and adding a pair of white pants that don't really fit the old-school aesthetic I thought they were going for. The first order of business was fixing the pants stripes so the red stripe flanked by two blue stripes "matched" the red stripe on the blue helmet again. On the home uniforms, I moved the TV numbers to the sleeves because I don't think there's any reason to have blank sleeves if you can put numbers there. I flip-flopped about what to do with the Giants' white jerseys. I don't really dislike the throwback design with all of the red, but I finally decided that it was time for something new. 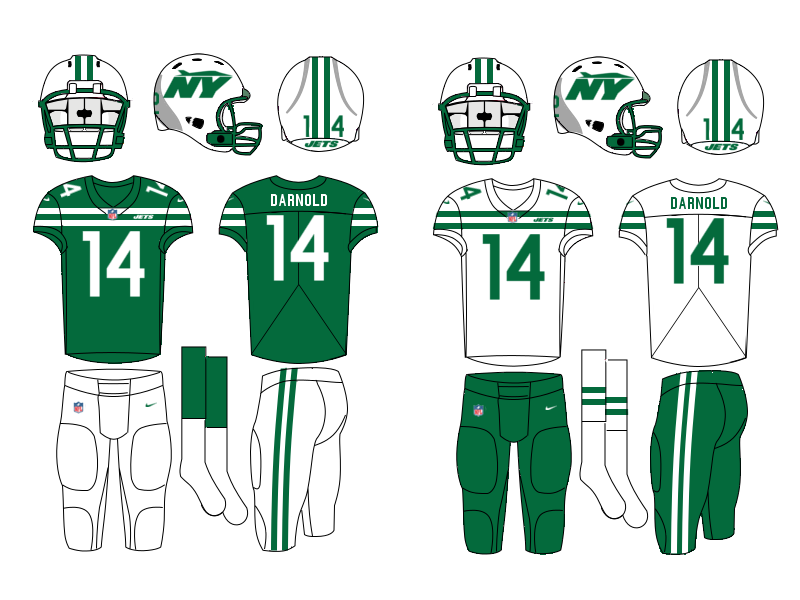 The new white jersey is another throwback inspired look, based on the white jerseys from the 1960's. The throwback alternate/Color Rush jersey is a throwback to the 1940's when the Giants wore a Michigan-like winged helmet design and red jerseys. 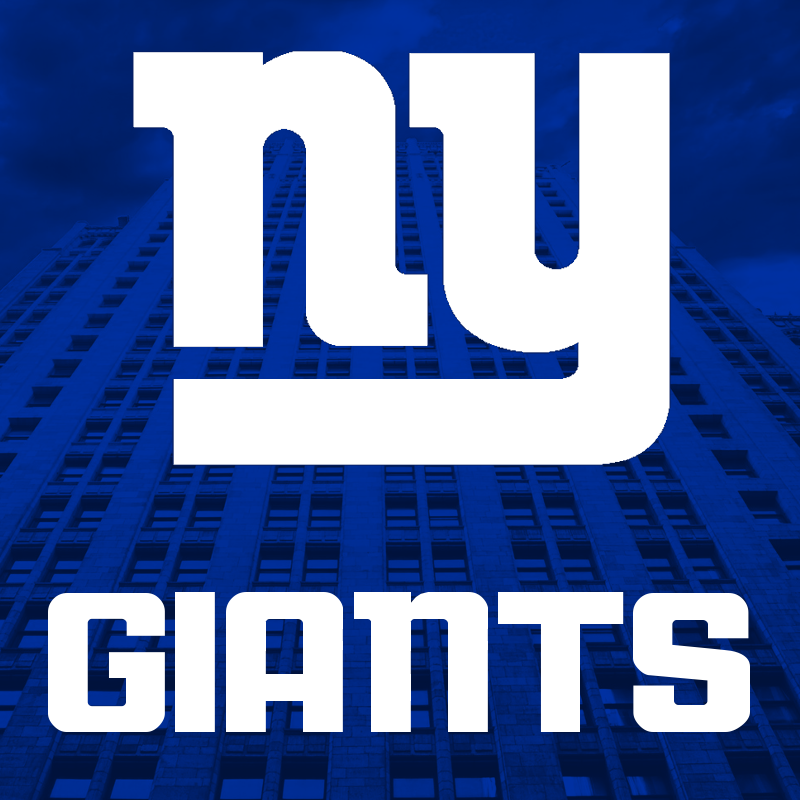 I thought it fit the Giants' aesthetic and would be unique to the NFL. Well, thanks for taking a look and please feel free to let me know what you think. May the Fourth Be With You. Literally the only thing I would change to the Eagles is the color of the collars and sleeve cuffs...make them silver on the home and away and green for the color rush...is it possible to do that through your template to see or no? What is that white jersey and the red jersey helmet? 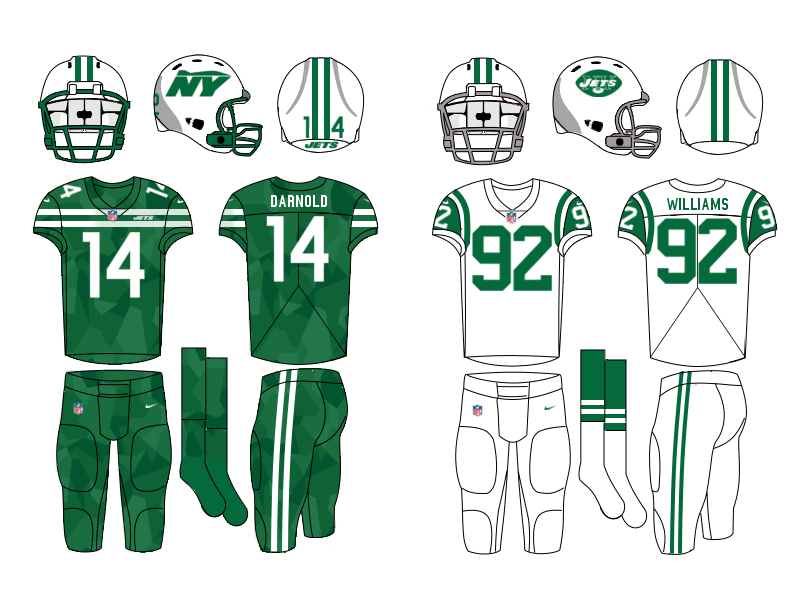 So, since the Jets announced that they would be updating their uniforms/logos next season, I'v been thinking a lot about the concept I did back in April and I liked it less and less. I think it had just a little bit too much going on, so I simplified everything. First, I made some changes to the logo. The new jet silhouette is simpler and has a lower profile atop the NY monogram. Please feel free to let me know what you think, any and all feedback is welcome. Thanks for taking a look. I like that design but I think it could be improved by going with a backwards facing tail fin on the logo like the F-117. I thought it was mountain when I first saw it. Better? I think it's an improvement. The tail fin did look clunky compared to the change you suggested,thanks. Excellent! Small detail but looks much better. 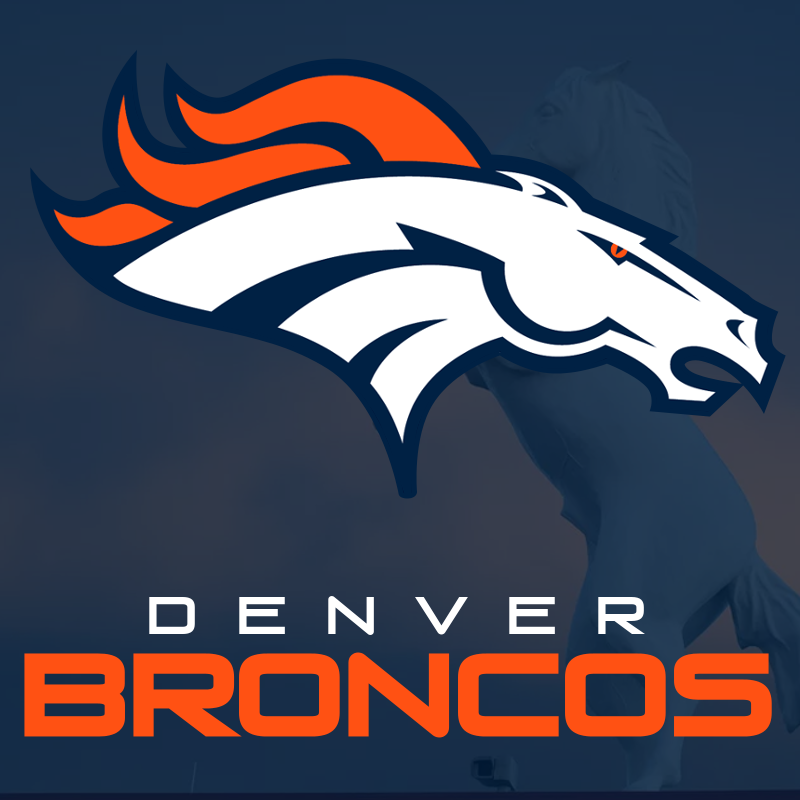 I've always liked the Denver Broncos uniforms to be honest. They were on the cutting edge of design when they debuted and I think they have aged well over the years. I'm also not opposed to a new design but I haven't ever seen one that I actually prefer to the current duds, so here's my take. Blue pants are added to the regular rotation as the primary road option, paired with orange socks of course, to avoid the leotard look. 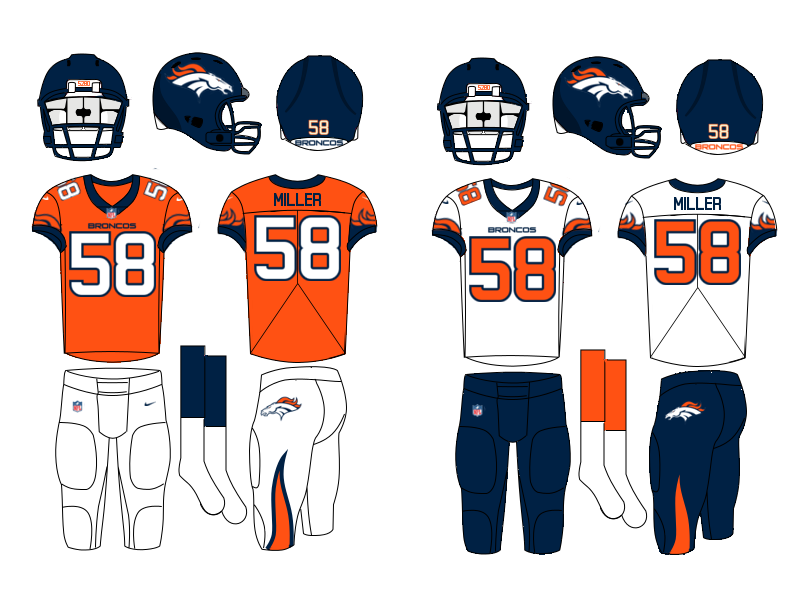 The sleeves feature the mane of the bronco logo and the orange and blue jerseys retain their home and alternate designations, respectively. The Color Rush-or whatever you wanna call it- alternate jersey is sky blue as a nod to the old royal/sky blue helmets of the Orange Crush days. Well let me know what you think and thanks for having a look. Wow, just wow. The addition of the blue pants is amazing. The font really brings out the orange perfectly. The sky blue uniform is quite smooth. Well done!